NEARLY 20 years ago, TorcUP was founded with one simple plan – to produce the finest torque tools available, and to back these tools with unsurpassed customer service. Founder John Kovacs knew he didn’t need to build just another bolting tool, but to build a better one. He created tools with increased reliability, accuracy, safety, and features that actually translate into benefits for their customers. According to Kovacs, TorcUP hasn’t stopped improving on torque tools, and never will, he says TorcUP is a company which will never rest on its laurels. Even though their tools are regarded by many as the finest in the industry, they still constantly work to make them even better. With several new products in the “pipeline”, TorcUP plans to continue to making good on their original promise – to produce the finest torque tools available. TorcUP’s world headquarters, a 2,323 sq m (25,000 sq ft) facility, houses its corporate offices, warehouse inventory, and handles all equipment calibrations, repairs and warranty services. TorcUP maintains the industry’s highest level of certification with its ISO/IEC 17025 compliance and is the only ISO/IEC 17025 certified calibration facility capable of producing certified calibration certificates for torque tools up to 135,582 Nm (100,000 ft lbs) in the industry. All of TorcUP’s satellite offices are operating in compliance with the ISO/IEC 17025 accreditation their world headquarters facility received. Customers are always welcome to visit the facility, located in Easton, PA, for a hands on demonstration, or TorcUP’s knowlegable sales team will be happy to bring their tools worldwide, to do an on-site demonstration. TorcUP prides itself on showing the customer just how robust their tools are by physically demonstrating them in action, as well as by actually taking the tools apart in front of the customer, and showing them the inner workings. TorcUP uses the slogan “Only TorcUP has the guts to show you the guts of the tool.” A tag line Kovacs came up with after literally revolutionising the design and operations of the torque tool. With their ever growing worldwide network of factory representatives, factory authorised service centres, and nearly 100 industrial sales agents in North America and international markets, TorcUP conducts business on every continent except Antarctica. Situated globally, stocking and non-stocking distributors who carry the TorcUP product line offer services ranging from technical sales support to rental of TorcUP equipment. With the purchase of a torque tool from TorcUP, representatives provide free training on maintenance, operation and application. At any time during the ownership of TorcUP equipment, the customer can request an on-site evaluation of the operational condition of their equipment at no-charge. TorcUP’s product line currently consists of three primary products: The TU Ultra series, the TX series and the RP series. 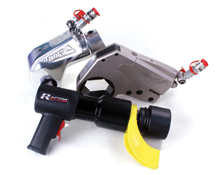 TU Ultra series is a square drive hydraulic wrench used with industrial impact sockets, and includes components made from the undisputed strongest material used in the industry. Due to its patented Mono-Body housing, which permits direct reaction against itself, the TU can be operated without the need for a reaction arm. With fewer parts than most competors’ tools, the TU series provides users, such as those in offshore applications, the ability to easily maintain and lubricate the tool, better protecting it against the harsh environments these tools are often used in. The TU Ultra Series includes seven different tool sizes which cover a torque range of 172 – 78,625 nm (127 – 58,000 ft lbs). The TX series incorporates a patented design which allows application of the wrench in restricted or confined areas. The full range is available in both metric and imperial. The RP (Raptor) series is a high speed pneumatic torque wrench. Said to have the perfect balance between useability and durability, the Raptor is operated with up to 80 psi of air, and offers “impact-free” operation with accuracy traceable to ±5 per cent. Powering TorcUP’s hydraulic torque wrenches is a complete line of electric- or air-operated hydraulic pumps built and backed to the same exacting standards as their wrenches. At the heart of each pump is field-proven Clydesdale technology. A close-coupled motor and one-piece Clydesdale chassis combine to offer a rigid unit with minimal flex and wear characteristics. The design of TorcUP’s pumps avoid the inherent issues of traditional pumps, creating a pump which is less susceptible to internal leakage, overheating and expensive repair. Electric pumps are available in medium- and high-flow versions, as well as 115 V or 230 V.
A host of complementary products including industrial impact sockets, castellated turbine wrenches, turbine slug wrenches, backup wrenches, flange spreaders, tensioners, ultrasonic controllers, and several other specialised tools for various bolting applications, diversify the TorcUP product lineup. Additionally, TorcUP’s engineering department can completely customise a bolting tool.